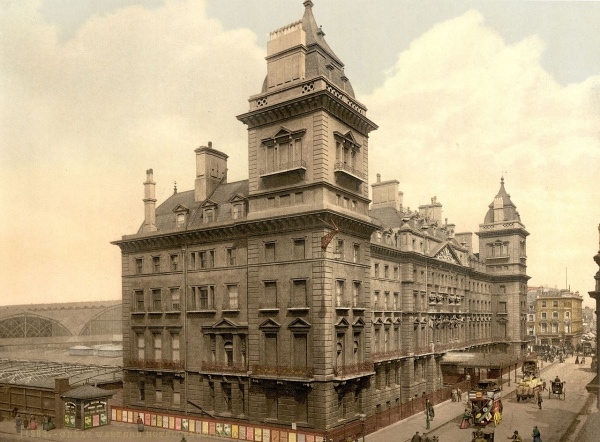 This grand Victorian hotel – originally known as the Great Western Royal Hotel – was among the first large hotels constructed in London in proximity to railway termini – in this case Paddington Station. Located 146 Praed Street, it was constructed in the 1850s to the designs of Philip Charles Hardwick and apparently cost some £60,000. The interior was designed in the Louis XIV style and the building as a whole was built with the intention of rivalling the great hotels of Europe. Isambard Kingdom Brunel, who conceived the project to provide accommodation for people travelling on the Great Western Railway to Bristol and the West Country (and so managed to convince the directors of the GWR to invest), was the hotel’s first managing director. The now Grade II-listed hotel was officially opened on 9th June, 1854, by Prince Albert and, apparently, the King of Portugal. The main block, which effectively forms the facade of the railway station behind it, is book-ended by two towers which are said to house two storey bedrooms. It boasts a sculpted pediment above the main entrance which was designed by John Thomas and features allegorical figures representing peace, plenty, industry and science. The railway company took over the hotel late in the 19th century and in 1907 it was apparently updated with electric lighting, telephones and a pneumatic messaging service. Much of the original ornamentation was lost when it was extensively modernised and extended in the 1930s in the art deco style under the eye of architect Percy Emerson Culverhouse. 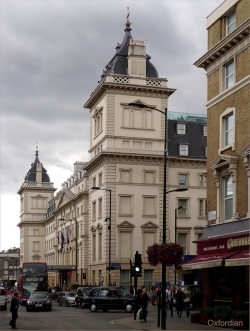 The hotel was sold off as part of the privatisation of the railways in 1983 and reopened as part of the Hilton hotel chain in 2001. It remains part of that chain today. • Rat catchers, trapeze artists and politicians are among the subjects depicted in photographs, prints and drawings which form the heart of a new exhibition spanning 500 years of London’s history. Opening at the London Metropolitan Archives, The Londoners: Portraits of a Working City, 1447 to 1980 includes portraits of unknown Londoners as well as some of such luminaries as author Charles Dickens, engineer Isambard Kingdom Brunel and Lord Protector Oliver Cromwell. Highlights include a rare photograph of Charles Rouse, reputedly the last night watchman (pre-cursors to the Metropolitan Police) still on duty in London in the mid-19th century, an 1830 lithograph of a crossing sweeper, the ‘Old Commodore of Tottenham Court Road’, and a number of photographs shot by George WF Ellis in the mid-1920s including a portrait of feminist and social campaigner Dora Russell. The exhibition, which is part of a series of events marking 950 years of London archives, opens on Monday and runs until 5th July at the LMA in Clerkenwell. For more, see www.cityoflondon.gov.uk/lma. 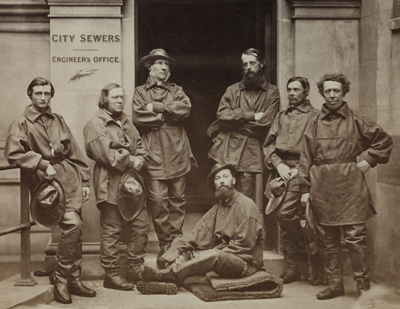 PICTURES: Top – A team of sewermen, photographed outside the City Sewers department in 1875. 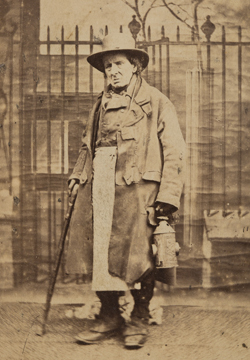 Right – Jack Black of Battersea, noted rat catcher to Queen Victoria, pictured here from a daguerreotype photograph taken for Henry Mayhew’s ‘1851 London Labour and the London Poor’. Both images © London Met Archives. • The response of artists and photographers to London’s Blitz during World War II forms the subject of a new exhibition which has opened at the Museum of London. Perspectives of Destruction: Images of London, 1940-44 explores how artists and photographers responded to the devastation caused by the massive aerial bombings. Much of the artwork was commissioned by the government’s War Artists Advisory Committee and focused on damage to buildings rather than deaths and injuries to people due to the impact it may have had on public moral. At the heart of the display is nine recently acquired drawings from official war artist Graham Sutherland depicting damage in the City of London and East End between 1940 and 1941. Also on show is a 1941 oil painting of Christchurch on Newgate Street by John Piper and David Bomberg’s Evening in the City of London, dating from 1944, which depicts St Paul’s Cathedral dominating the horizon above a devastated Cheapside. There’s also a photograph of a V-1 flying bomb narrowly missing the iconic cathedral which, along with eight others, was taken by City of London police constables Arthur Cross and Fred Tibbs. Other artists with works featured include Henry Moore, Bill Brandt and Bert Hardy. Runs until 8th May. Admission is free. For more, see www.museumoflondon.org.uk. • A series of installations commissioned from 12 artists – asked to imagine what Europe might look like 2,000 years from now and how our present might then be viewed – have gone on display in the V&A as part of the week long ‘Collecting Europe’ festival. The festival, which only runs until 7th February, includes a range of talks, discussions, live performances and workshops aimed at encouraging debate around Europe and European identity in the light of the Brexit vote. The installations, commissioned by the V&A and Goethe-Institut London, have been created by artists from across Europe. For more, see www.vam.ac.uk/collectingeurope. • Bronze casts of black women’s movement activists’ fists go on display at the City of London’s Guildhall Art Gallery from Tuesday. A Fighters’ Archive, features the work of sculptor Wijnand de Jong and pays tribute to 15 women who were members of various activist groups. The sculpture takes the form of a boxing archive – casts of boxers’ fists collected by boxing academies to commemorate prize fighters – with the fists cast from life. Subjects include Professor Dame Elizabeth Anionwu, Emeritus Professor of Nursing at the University of West London and patron of The Sickle Cell Society, Mia Morris, creator of Black History Month, and Gerlin Bean, founder of Brixton Black Women’s Centre. The fists can be seen until 19th March. Admission if free. For more, see www.cityoflondon.gov.uk/things-to-do/visit-the-city/attractions/guildhall-galleries/Pages/guildhall-art-gallery.aspx. As mentioned last week, there are a number of official English Heritage blue plaques in London which commemorate events rather than people. Alongside the blue plaque commemorating the first V1 flying bomb to hit London (the subject of last week’s entry) is a blue plaque commemorating the site where one of world’s most famous ships – the SS Great Eastern – was built. 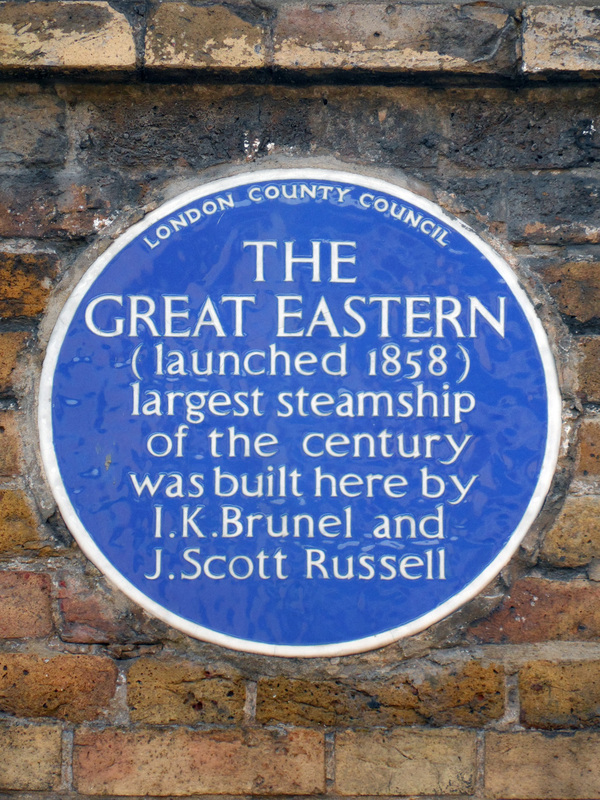 The plaque is located at Burrells Wharf, 262 Westferry Road, on the Isle of Dogs in the Docklands, and it was there that the design of Isambard Kingdom Brunel, who had previously designed the SS Great Western and the SS Great Britain, was realised under the direction of naval architect and ship builder John Scott Russell, of J Scott Russell & Co. The ship, which had a double hull and immense paddle wheels, took some five years to build at a site in Millwall on the Isle of Dogs (if you’re interested in the etymology of the latter, see our earlier post here). It was supposed to be launched before a crowd of thousands on 3rd November, 1857, (the Great Eastern Ship Company had sold tickets). But the launch was unsuccessful as the equipment supposed to haul the ship to the water failed (and it was during this unsuccessful attempt that the ship was apparently initially christened SS Leviathan; her name was changed to the SS Great Eastern soon after). A couple of further unsuccessful attempts were made before, on 31st January, 1858, the 211 metre long ship – aided by an unusually high tide – was finally sent into the Thames (unusually, it was launched sideways). The outfitting of the ship, which started in January, 1859, took six months and on 6th September, the ship made its maiden voyage from London to Weymouth, a voyage which was marred by the tragic death of a number of stokers in a boiler explosion. Sadly, Brunel himself died soon after the maiden voyage, not in the sort of triumphant circumstances he might have hoped for. While it was originally designed to sail to India and the Far East, it was in the Atlantic where the ship took up the passenger trade. Her first voyage to North America took place in June the following year and the SS Great Eastern continued to cross the Atlantic over the next few years (including during the American Civil War when she took British troops to Canada) but, blighted by back luck (including, in 1862, running into an uncharted rock in New York harbour) and facing the competition of faster, smaller ships, she was never really a commercial success. Sold off, the SS Great Eastern was reinvented in the mid 1860s as a cable-laying ship and did so in various parts of the world until, after being laid-up in 1874, sailing to Liverpool where she became something of a tourist attraction and a floating billboard before eventually being scrapped in 1889. There was legend that two skeletons were found between the two hulls when the ship was broken up – that of a riveter and his ‘bash boy’ (a young lad charged with heating and putting the rivets in the hole) – and it was believed by some that it was their deaths which had brought the ship such bad luck. The plaque was erected in 1992. • The last 70 years of British history is under the spotlight at the Hayward Gallery, South Bank, in a new exhibition, History is Now:7 Artists Take on Britain. As the title suggests, seven UK-based artists – John Akomfrah, Simon Fujiwara, Roger Horns, Hannah Starkey, Richard Wentworth and Jane and Louise Wilson – are each looking at a particular period of cultural history spanning the years from 1945 to today. The artists have selected more than 250 objects from public and private collections and have displayed these along with photographs, newspapers, films, domestic items and artefacts. The exhibition, which runs until 26th April, is part of the Southbank Centre’s Changing Britain 1945-2015 Festival which runs until 9th May. For more, see www.southbankcentre.co.uk. • The use of Napoleon’s image in propaganda during the Napoleonic Wars is the subject of an exhibition which opened last week at the British Museum in Bloomsbury. Bonaparte and the British: prints and propaganda in the age of Napoleon looks at how propaganda was used on both sides of the channel and includes works by both British and French satirists. Among British artists whose work is featured is that of James Gillray, Thomas Rowlandson, Richard Newton and George Cruikshank and the exhibition also features a range of objects – mugs, banners and even Napoleon’s death mask – drawn from the museum’s collection. The exhibition, which runs until 16th August, is free and can be found in Room 91. For more, see www.britishmuseum.org. • Can you pick a copy? 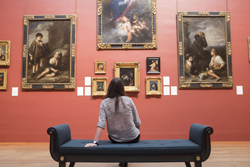 Visitors to the Dulwich Picture Gallery in the city’s south have the opportunity to test their skills with a new initiative which has seen a Chinese replica placed somewhere among the 270 Old Master paintings on display. Made in China: A Doug Fishbone Project explores the nature and importance of the concept of the original versus that of the copy and the role of art as commodity. People have three months – until 26th April – to visit the gallery and find the replica painting before submitting their answers via an iPad in the gallery (those who correctly identify it will be entered into a competition to win a custom print from the gallery’s collection signed by the American artist Doug Fishbone). The replica will be revealed on 28th April when it will hang side-by-side with the original. Admission charge applies. For more, see www.dulwichpicturegallery.org.uk. PICTURE: © Stuart Leech/Dulwich Picture Gallery. • The Talk: Isambard Kingdom Brunel – The man who built the world. Robert Pulse, director of The Brunel Museum, will give a free talk about the life and achievements of the great Victorian engineer Brunel at the John Harvard Library 211 Borough High Street on 17th February at 6.30pm. For more information, follow this link. • On Now: Fulham Palace through the Great War. This exhibition at the former home of the Bishop of London on the Thames River in west London tells the story of the palace during World War I and examines the lives of those connected with the palace who died in the conflict, such as William Burley, son of Bishop Winnington-Ingram’s chauffeur. It tells how the bishop – described as an “enthusiastic” recruiter – visited the frontline in 1915 and how, in 1918, the palace was occupied by a Red Cross hospital. Runs until 16th April. Entry is free. For more, see www.fulhampalace.org/visiting-whats-on/exhibitions/. Given our current series on great London projects of the Victorian age in honour of the Tube’s 150th birthday, it’s only fitting that we should take a look at the Crystal Palace, a wonder of the age which once adorned the grounds of Hyde Park. 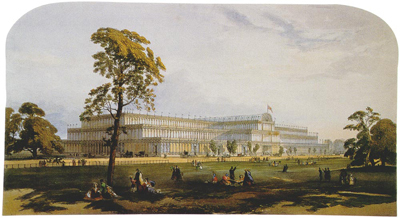 Built as the centrepiece to the Great Exhibition (more properly known as the Great Exhibition of the Works of Industry of All Nations) of 1851 – an event enthusiastically supported by Prince Albert, the Crystal Palace (pictured left in an image published in 1854) was a vast cast-iron and glass exhibition hall which took its nickname (apparently first mentioned in Punch magazine) from the enormous amount of glass used in its creation. Designed by gardener and architect Sir Joseph Paxton (his designs were chosen after an international competition failed to come up with anything suitable), the enormous and innovative structure, located just south of the The Serpentine, owed its design inspiration to his previous work on glasshouses. Measuring 1,848 foot (563 metres) long, it was completed in just five months. The building, which needed no artificial lighting during the day due to its massive expanses to the glass, was so large that full-sized elm trees already growing in the park could be enclosed within it. More than six million people visited the building during the Great Exhibition, held from 1st May to the 15th October, 1851. As well as hosting 14,000 exhibitors, the building also housed the first major installation of public toilets in which George Jennings had installed his ‘monkey closet’ flushing lavatory. While the structure was only meant to be temporary, such was its appeal (Paxton was knighted for his design efforts) that following the closing of the exhibition, it was purchased by the Crystal Palace Company. A massive feat of logistics saw it dismantled and relocated to a site on what was then Penge Common at Sydenham Hill in south London where it was rebuilt (albeit to a different, much larger, design). It reopened in 1854 and contained a series of courts, illustrating art from various periods of history as well as other exhibits and performance spaces. The grounds, meanwhile, were decorated with gardens and fountains designed by Edward Milner which drew water from two water towers designed by Isambard Kingdom Brunel. There was also a maze (still there) and also featured some terrific life-sized statues of dinosaurs created by Benjamin Waterhouse Hawkins (these Grade I-listed specimens, the first of their kind in the world, are still located in Crystal Palace Park). Interestingly, the fountains were later grassed over and one was used as a sports stadium, famous for hosting the first 20 FA Cup Finals. The site also became home to the Crystal Palace School of Art, Science, and Literature and later, the Crystal Palace School of Practical Engineering. The Crystal Palace remained in use for various purposes – including as a TV studio for John Logie Baird – until late in 1936 when it was destroyed by fire, the origins of which apparently remain somewhat mysterious. The name Crystal Palace has remained, however, as well as being given to Crystal Palace Park – the actual site where the building once stood – it also continues to lend itself to the area in which the structure once stood. There’s also now a foundation – the aptly named Crystal Palace Foundation – which works to “keep alive the memory of the Crystal Palace and its major role in the story and social development of Victorian and Edwardian England” and a small museum, The Crystal Palace Museum, housed in a building constructed around 1880 as a classroom for the Crystal Palace Company’s School of Practical Engineering. Plans for building a replica of Crystal Palace have been mooted but there’s no sign of it rising once more at this stage. For more on the Crystal Palace, see Patrick Beaver’s book, The Crystal Palace: A Portrait of Victorian Enterprise . While the Greenwich foot tunnel may these days be more well-known due to the fact it is still open to pedestrians, London’s oldest under-Thames tunnel (also credited as the oldest underwater tunnel in the world) actually runs between Rotherhithe on the river’s southern bank and Wapping on the northern. First opened in 1843, the Thames Tunnel (pictured left during a brief reopening to pedestrians in 2010) was the first major project of star Victorian engineer (and delightfully named) Isambard Kingdom Brunel (who, at the age of just 19 started work on the job with his father, a French engineer named Marc Isambard Brunel) and was known for a time as the eighth Wonder of the World. It was constructed after demand grew for a way to transport goods across the crowded Port of London to the east of London Bridge. Given the height of the masts of larger ships, a bridge was deemed impracticable with the ramps required to take wheeled transport to the necessary height far too long (although this problem was overcome at the end of the 1800s by the use of new bascule technology in the construction of Tower Bridge). Following several failed attempts to dig a tunnel under the Thames, Marc Brunel was given permission to build the new tunnel in the mid 1820s. The project relied on the use of a ‘tunnelling shield’, a then state-of-the-art technological solution to under river tunnelling which had only a few years earlier been patented by Marc Brunel and Thomas Cochrane, and Brunel initially thought the project would only take three years (it ended up taking as many as 18). Construction by the newly formed Thames Tunnel Company, which had the support of none other than the Duke of Wellington, commenced in early 1825 at the Rotherhithe end. The shield enabled miners to dig out the tunnel while bricklayers came along behind them. While it significantly reduced the risk of a collapse (although several floods still did occur, taking the lives of six men – a fact which didn’t apparently much deter the sightseers who paid for the privilege of seeing the shield in operation), working conditions remained terrible with the men constantly showered with water from the river which was at that time the city’s main sewer. How many died indirectly as a result of working on the project is unknown. Indeed, such was the stress of the project that Marc Brunel, later knighted for his efforts in building the tunnel, himself suffered a stroke during its construction. Isambard Brunel, who took over as the project’s engineer when the resident engineer fell ill in 1826, himself came close to being killed when he had to flee the flooding tunnel. After much delay (including seven years in which the unfinished tunnel was left untouched) and several more disasters, the tunnel was finally completed in November, 1841. After being fitted out with lighting, spiral staircases and roads in the following years, it was finally opened to pedestrians only on 25th March, 1843. While it was originally envisaged that the primary purpose of the tunnel would be to transport goods under the river, this never occurred. 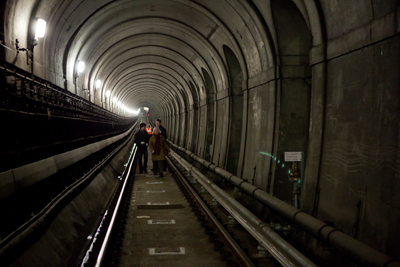 Still, it did capture the public’s attention and as many as 50,000 people walked through the tunnel on the opening day (among the initial visitors to the tunnel was Queen Victoria herself). Within 10 weeks of its opening, a million people (a figure equal to what was then half the population of London) had reportedly passed through it. Despite the number of people initially using it, however, the tunnel was still not a financial success and over the ensuing years became noted as a gathering place for unsavoury types. In 1865 it was purchased by the East London Railway Company which subsequently incorporated the tunnel into its railway network with both the Wapping and Rotherhithe entrance shafts converted into stations. It later become part of the London Underground network – the – and since 2010 has been part of the London Overground. Both stations are still in use and you can get a good sense of what the tunnel was like by riding the overground between Rotherhithe and Wapping. 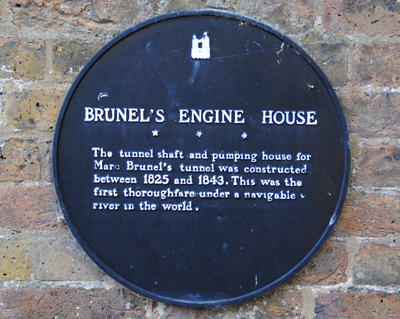 The Brunel Museum in Rotherhithe – actually housed within a building originally used to house machinery for draining the tunnel – see plaque above – is also a great place to find out more about the project and Brunel. Visit www.brunel-museum.org.uk for details. For more on the life of Brunel, see Steven Brindle’s Brunel: The Man Who Built the World.